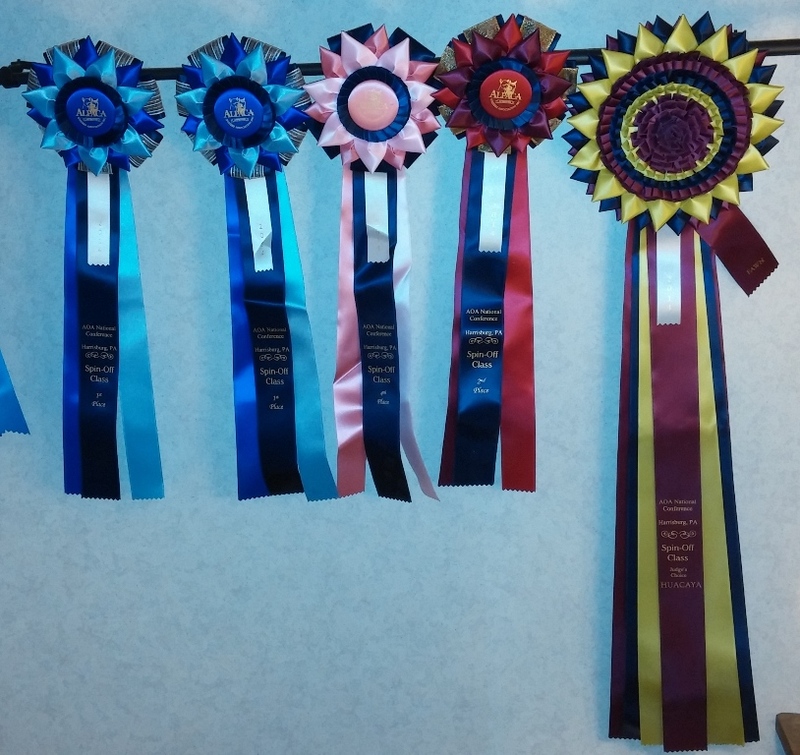 The results from the Alpaca Owner’s Association National Show are in, and we’ve received our Spin-Off entries back with an impressive array of ribbons. We entered 2 ounce samples from five of our alpacas this year, and were pleased with how well they did. Our fabulous new herdsire Polar Ice won First Place with many complementary notes on his score card including, “beautiful, cohesive ball of bright, soft, clean fiber”, “a pleasure spin”, and “a lovely yarn with a soft hand.” We have yarn from Polar Ice available in a beautiful, bulky weight online and in the store. June Delight added another First Place to her collection of ribbons, with the judge commenting on her “nice crimp and bundles.” Our adorable J Dubs, “Dubbie”, won Second Place in the Light class. Lucky did not score as well in this show as he did in the Southern Select, illustrating the importance of choosing and preparing the sample. 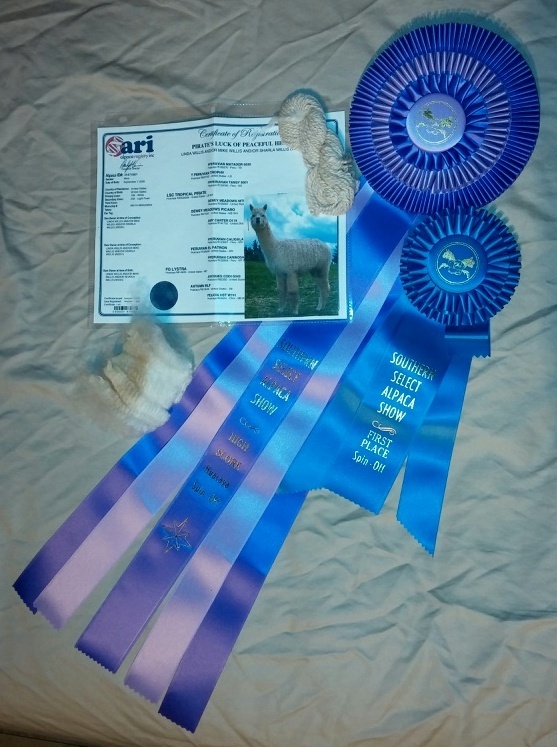 He was marked down for dirt and vegetable matter which impacted his score in all three judging areas, Fiber Criteria, Spinning Criteria and Finished Product, ultimately winning a Fourth Place ribbon. Our star of this show, though was our lovely Bonnie Alice, who at almost six years of age won Judges’ Choice among fawn alpacas. 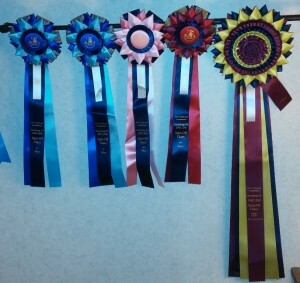 Over the years, Bonnie has won numerous ribbons for her fiber, doing particularly well in Spin-Offs. 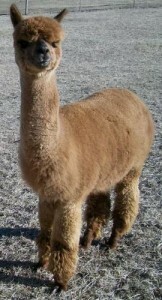 She has shown in both Light Brown and Dark Fawn classes. In this show, Bonnie won Second Place in her class of older Fawn alpacas based on points, but then was selected as the Judges’ Choice among all the Fawns entered in the show. 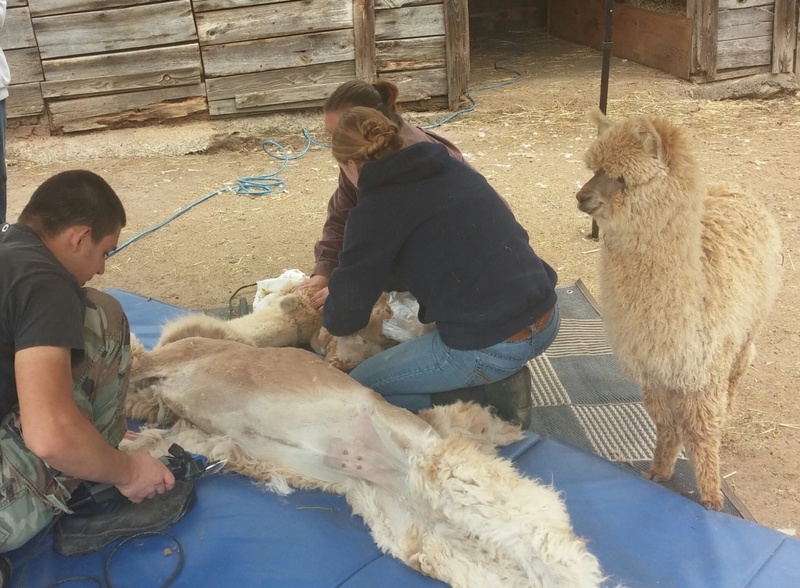 Alpaca Shearing season is here! Shearing season is always a fun time to visit the farm because you can see alpacas both shorn and unshorn, and be amazed at the difference their lovely (and dense) alpaca coats make in their size. 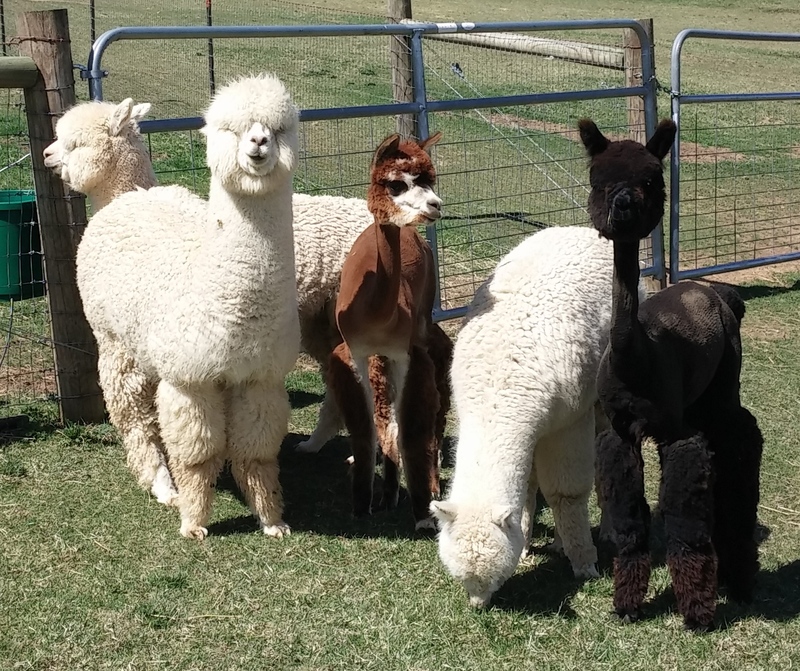 We have a good start on shearing already and have many of the alpacas running around the farm showing off their skinny bodies and long necks, so stop by and say hi to our sleek alpacas who are ready for summer this week while they wait for everyone else to get shorn. David and Claire have been busy shearing for alpaca farms in North Carolina and Virginia, including our farm last weekend. They will be shearing at Peaceful Heart Alpacas again on May 3 & 4. We invite everyone to come by the farm to watch the alpacas get their winter coats off and prepare for summer. The farm will be open our regular hours on those weekends, Saturday 10am – 5pm and Sunday 1-5pm. Shearing will be ongoing throughout the day with a break for lunch. 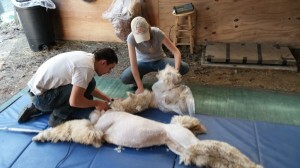 David and Claire shearing at Majestic View Alpacas. Six month old cria Sylvia (Majestic View's Silver Linings) is supervising the shearing of her mom Raquelita. We just received the results from the Southern Select Spin-Off and we couldn’t be happier. 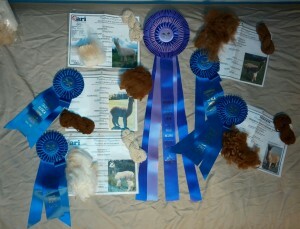 We entered fleece from 5 alpacas, and all 5 brought home First Place Ribbons in their individual classes! 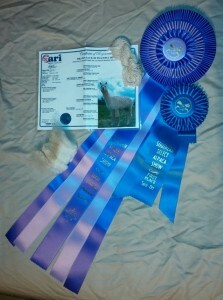 Pirate’s Luck, “Lucky,” also won Highest Scoring Huacaya alpaca!! A Spin-off consists of sending in a 2 ounce sample of fiber from the blanket of the alpaca (their prime, or best, fiber). This amount of fiber is about the size of a gallon zip lock bag. The spin-off judge takes the sample and spins a portion into yarn, judging the fleece, how easily and well it spins, and the quality of the finished product. The judge provides detailed feedback, which gives us information that is helpful in processing our fiber and also in future breeding decisions. The fiber is scored and ribbons are awarded for each color and age group. For the 2014 Southern Select Spin-Off, we sent in samples from Pirate’s Luck, Sunspot, Gabriel, Bonnie Alice, and June Delight. All of these alpacas were born on our farm, and most of them have won ribbons previously. We are very proud of them all.